Since it’s a free ware and open source tool, you can download it from, its official download page for any version of windows. After downloading, install this copier on your system and as soon as you finished installing launch this software to apply next step. 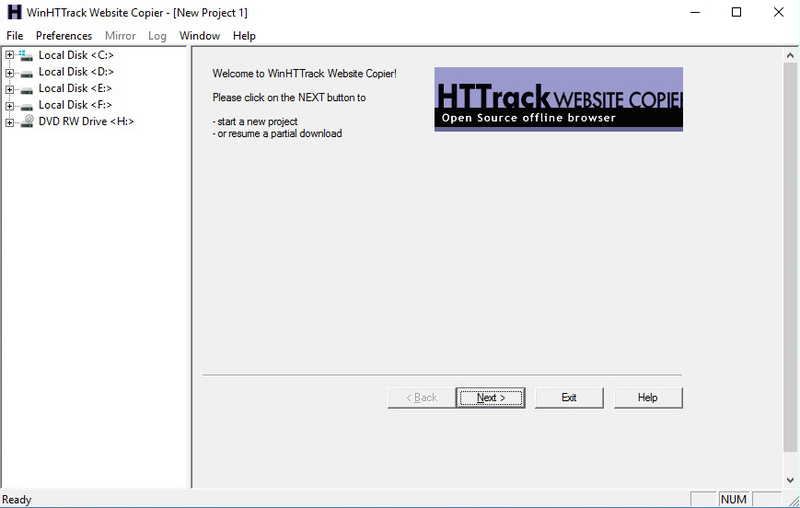 Since in this tool every downloaded blog/website is called as project, your new download will be called as Project. Hence, click on ‘Next’ button to start new project. 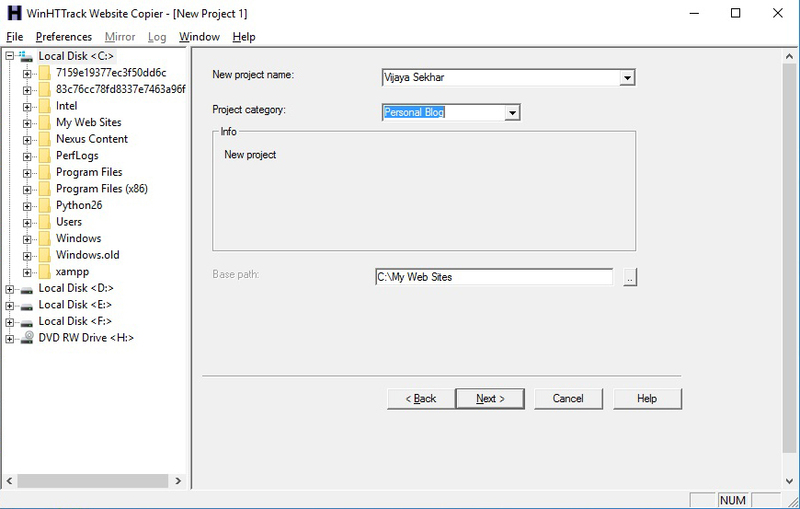 In next window, enter the name and category of your project. In my case I have name it as ‘Vijaya Sekhar’ and category as ‘Personal blog’. You can give the name and category of your choice. After specifying name and category to your project, click on ‘Next’ to continue. The next windows which appear, ask you to enter the web address of that blog/website which you wish to download for your offline reference. Action : It contain several option which you may choose as per your requirement. And default option is ‘Download website’ for which you are using this tool. Add URL : Using this option you can add URL and login details of the website which you want to download using this tool. Login detail may require depending upon the type of webpage. 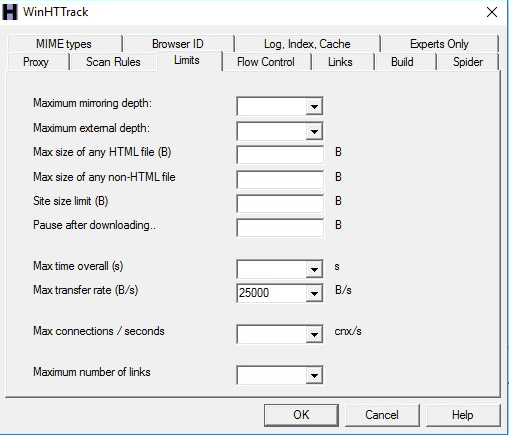 Preference and Mirror option: Here you can manage many options like defining the bandwidth of the download, no. of bytes to be download, SCAN rule, Browse ID, download Limits, etc. This all options all not necessary to edit or overwrite. You can simply enter the website address in text area and leave the other option as it is. After you are done with the above setting you can click on ‘Next’ button to continue. Now after you proceed to next window, you will have to define the connection parameters. Even though this is also an optional, if you want to edit, you can select your network provider and select radio button i.e. Disconnect when finished orShutdown PC when finished. You can also save this setting till here and close this tool. You can continue from this step next time, when you launch this tool to download. Once you are ready to download, click on ‘Finish’ button to start the downloading. Your downloading window will appears as shown below. If you wish to abort, you can abort this downloading by clicking on ‘Cancel’ button. Once the downloading is complete, you can access your downloaded blog/website by clicking on ‘Browse Mirror Website’.